This Ftse100 head and shoulders pattern revisited and updated chart shows that we were correct to run swings and long term trades as described in Ftse100 head and shoulders pattern revisited posting. Ftse100 has now hit the minimum target at the 23.6% fibonacci retrace level and this is where it gets a bit more tricky for short term traders. 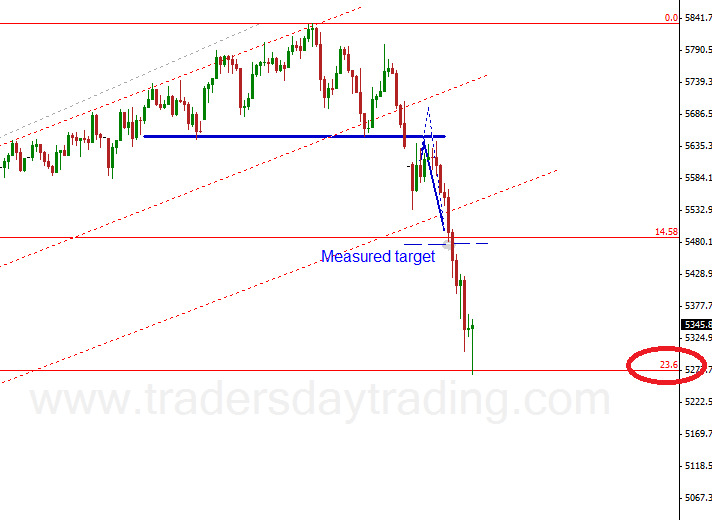 This initial drop from the high, although it had a bit of a kick, it does look corrective in nature at the moment. What we expect to see is that this is the first leg of a larger correction which leaves room for another pop at that neckline again but, I should stress that we can not tell that from this chart and is speculative at this stage as there is no way to know for sure. Technical analysis is all about odds and probabilities and we do not try to call every move. Trying to do that is what catches a lot of folks out. Technical analysis is about swinging the odds of entering a profitable trade in you favour and that is a case of identifying the set ups with high odds probabilities. Anything else is just guessing and increases your odds of getting it wrong. 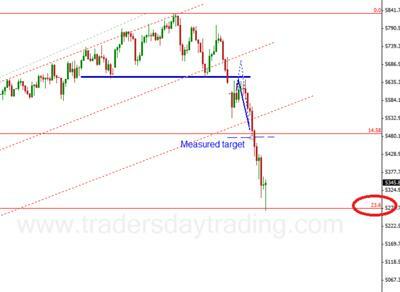 What we need to do now is follow our short term analysis from here unless it is for a long term position trade. With 200+ points pocketed in 4 days, this is the banking zone for swing trades right here but some may prefer to use a trailing stop...Long term traders now need to work out a sensible protective stop. Kenny has shown time and time again the ability to show us direction in these markets. This was a clear call with clear lines and clear area of where right to run for a target and where wrong to cut.